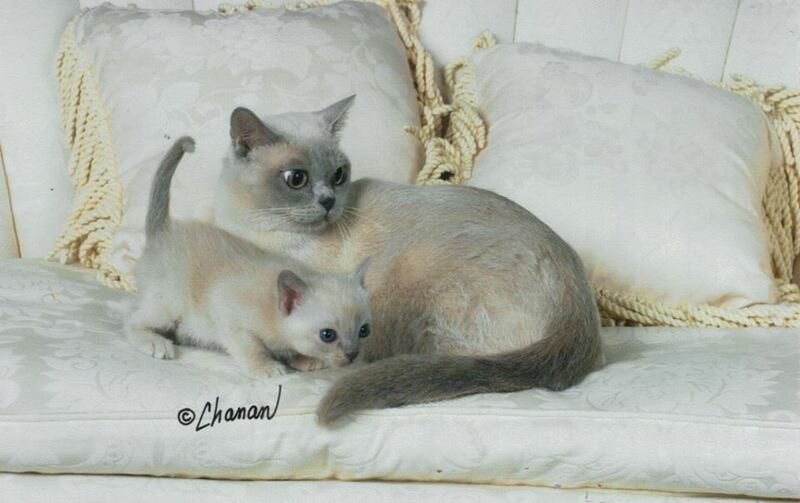 Suzanne and Dr. Kenneth Berrin are the founders, owners and proud parents of all kittens born at Bon Marché Burmese. Suzanne is a former pastry chef specializing in creating wedding cakes. We both were novice gardeners and spent years designing and maintaining our garden in San Diego, CA. Our prize-winning roses were tended by Ken and proudly exhibited by myself at local garden clubs. Once the wisteria bloomed and the English Rose Garden was thriving, I found myself wanting a small companion to love, nurture and spoil. ​While on my way to the garden one afternoon, I glanced at the television, and saw a sight that made my heart race with excitement. Perfectly poised on a pedestal sat a Burmese cat, its posture regal and its golden eyes gazing back at me mysteriously. The sight was so mesmerizing, that time stood still for a few moments. Within three days we had appointments with two local Burmese Breeders. Our intention was to purchase a sable male Burmese. We visited Carol Mackay and the Netsuke Cattery in early July of '97. There were 3 or 4 kittens to choose from and it was hard deciding just who was the most adorable! The decision was made for me when a spunky little Champagne female kept rubbing against my leg. She was cute, but seemed a little too quiet. Just as I asked Carol if this kitten was ever more "active," she expertly performed 3 back flips, landing gracefully and very coolly meeting my gaze. Needless to say, the papers were quickly signed and "Netsuke' Suzette" joined our life. The Burmese is an elegant and refined breed. Once given to Novitiate Monks to raise in the Temples, they have been cultivated for centuries to be devoted and loving companions. They are known for their keen intelligence, sleek, graceful bodies, and short, gleaming fur with the subtle sheen of finely woven silk. Their posture is regal, their lovely broad chest proudly crested. Wonderfully calm and adaptive, they readily bond with children, adults, feline and canine friends. Forever young, they retain their playful, sometimes silly antics well into adulthood. They are ever curious and always up for a game of "fetch" or a dive under the covers or chasing a beam of sunlight seeking the warmest spot in the house. Whether they are dark, luscious "sable", honey-brown "champagne", pearly "platinum" or baby blue, their mesmerizing golden eyes speak volumes as to the depth of their affections. This website is dedicated to my beautiful mother, Cecile Kuttnauer - whose devotion to and love of cats - and dogs - was unrivaled. Our favorite "rainbow litter", blue, champagne, sable, and platinum.